A journal is a powerful tool. It unlocks creativity; hones observation skills; provides a window into the past; and is the data collection backbone of the scientific process – all while reinforcing important record-keeping skills such as reading, writing, and drawing. Notable scientists, naturalists, and philosophers such as Charles Darwin, Henry David Thoreau, Ralph Waldo Emerson, Aldo Leopold, Rachel Carson, and John Muir were all known for keeping journals of their observations, poems, and discoveries. Many of their famous literary works and groundbreaking observations were published from their journals. Charles Darwin’s Voyage of the Beagle was his field journal that detailed his observations of the ecology in the Galapagos Islands. The next time you lead a PLT activity, ask your students to record their observations of nature in a journal and watch as experiential learning is taken to a whole new level. 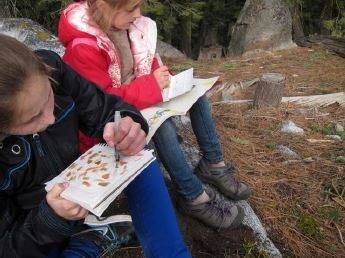 Science, technology, engineering, math (STEM), language arts, art, history, and even music can be addressed using PLT activities and nature journaling practices. Activity 4, Sounds Around from PLT’s PreK-8 Environmental Education Activity Guide is one of my favorite examples of the versatility and cross-curricular nature of PLT and journaling. The activity can be conducted inside or outside, and there are four different parts which all have recommended grade level ranges. Have your students make a sound map by drawing an “X” in the middle of a page of their journal to represent where they are sitting. Then have them use pictures, shapes, or words to show the relative locations of the sounds around them. Students can create multiple maps by sitting in different locations. Have students present their sound maps and describe the sounds they heard. Have students research the sounds that they observed. What made these noises? How do animals (or objects) produce those sounds? Have your students record all of the sounds they hear in any given area. If available, you can also use a sound meter to measure the sound level in decibels. (Need a sound meter? There’s an app for that! Google Play or iTunes) Have students compare the “loudness” of the sounds they heard in different areas and write about the sounds in each location. Is there a reason why certain sounds are louder in some areas versus others? For example, discuss why you might hear more natural sounds in a remote area, such as a field or forest (birds, streams, leaves rustling, etc.) and other mechanical sounds near a busy intersection (cars, air traffic, construction, etc.). Choose a location such as a park or open area on the school grounds or in the community that is greatly affected by noise. Determine sources of noise and discuss ways to mitigate the impact, such as planting trees or building another type of noise barrier. Encourage students to sketch the area and propose ways to reduce the noise. Help students plan and carry out a service-learning project based on their proposals. Have your students graph the sounds they heard, comparing how loud each noise was. You can also have students attempt to calculate the distance to the source of a sound. Here’s a classic example of how to calculate how far away lightning struck by calculating how long it takes to hear the thunder. – What were the sources of the sounds you heard? – Which sounds did you like? – Which sounds did you dislike? Encourage students to draw or illustrate their observations in their journals during each activity component. You can also have your students create their own nature journal. have heard then? Students can then research the local area to find out its history. Traditional journaling has expanded beyond paper. With social media, blogs, and photo and video sharing platforms, teachers are finding new ways to record and share their writings, discoveries, and class achievements. Consider starting an online nature journal with your students, and detail your discoveries in the natural world through a classroom blog. This way you can share your stories with other teachers around the country or the world and see what other virtual pen pals are finding as well. Nature Journaling with PLT – Here’s a handout I developed to teach the basics of nature journaling with students using PLT and other recommended resources. View beginning drawing exercises, tips for improving observation skills, and ideas for student craft projects to create personalized journals. John Muir Laws – Nature Stewardship through science, education, and art. This book is by far my #1 pick for reconnecting with and discovering nature through journaling. It’s beautifully illustrated and offers simple techniques, exercises, and prompts for all ages. I highly recommend this if you or your students are interested in starting a nature journal. Learn new ways to experience nature and find hidden natural treasures, while developing your observational skills. Inside this book, you’ll find photos, illustrations, and descriptions to help you find animals, recognize sounds, or even attract wildlife to your backyard. This book offers many tips for recording your outdoor adventures, sketching, and improving your outdoor photography. This guide offers tips on getting started with keeping a nature journal. Inside, you’ll find tips for beginning nature journal keepers, equipment recommendations, and instructions for setting up a journal. Rob Beadel is Arkansas PLT State Coordinator and the Director of Forestry Education for the Arkansas Forestry Association Education Foundation. Use these ideas to engage middle school students in STEM as they explore wetlands and learn about why they are important. Students investigate the papermaking process by trying it themselves. Students are thrilled to find that they can make paper and that their product is practical, as well as beautiful. Watch a video of the paper-making process used in this activity.